Flameshield® aboveground storage tanks are manufactured with a tight-wrap double-wall design. Standard features include 2-hour fire-tested performance, built-in secondary containment and interstitial monitoring capability. Flameshield® tanks are also available in Vertical and Rectangular designs. 2-hour 2000° fire-test, as required by Southwest Research Institute Standard SwRI 97-04, validates performance of non-insulated tanks. Primary and secondary tank can be tightness tested on site with standard testing procedures, or manufacturer may ship with vacuum in the interstice to prove integrity of both walls during installation. Provide Flameshield 2-hour 2000* fire-tested double-wall aboveground storage tanks. Tanks shall bear the Steel Tank Institute Flameshield identification label. Aboveground tanks shall bear Southwest Research Institute 97-04 label. Tanks shall be manufactured in accordance with Steel Tank Institute Flameshield Standard for Aboveground Tanks. 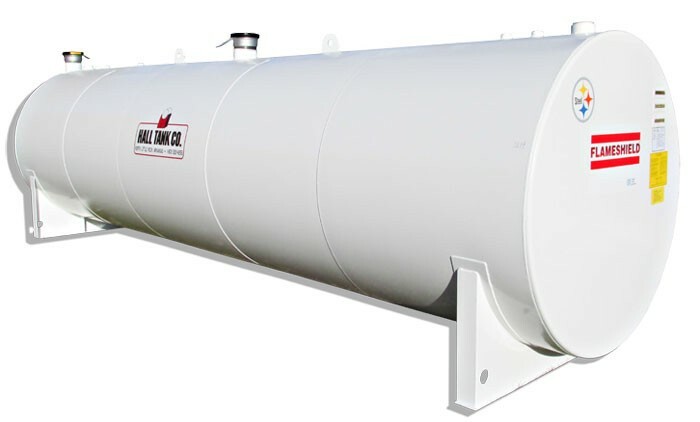 Aboveground tank primary and secondary containment (inner and outer walls) shall be manufactured in accordance and listed with Underwriters Laboratories UL 142, Standard for Steel Aboveground Tanks for Flammable and Combustible Liquids. Integral secondary containment shall be testable and provide access for interstitial leak detection monitoring. Listed supports shall be used for all horizontal, rectangular and vertical tanks. Supports are designed for seismic loading, if necessary.